2015 Volkswagen Caravelle review | What Car? The Volkswagen Transporter has been riding a steady wave of success over the last decade. From 2009 to 2014, the German manufacturer experienced increased sales year-on-year. In total, 1.7 million examples rolled off the production line over the fifth-generation van's 11-year lifespan. This new sixth-generation Caravelle MPV version, based on the Transporter, brings a redesigned front and rear end with new LED lights, an updated interior to deliver 'car-like levels of style and quality' and a new range of Euro 6-compliant diesel engines. Like its predecessor, the Caravelle has seating for up to seven. It's available with a short or long wheelbase and buyers initially get the choice of three trim levels - Startline, Trendline and Highline. 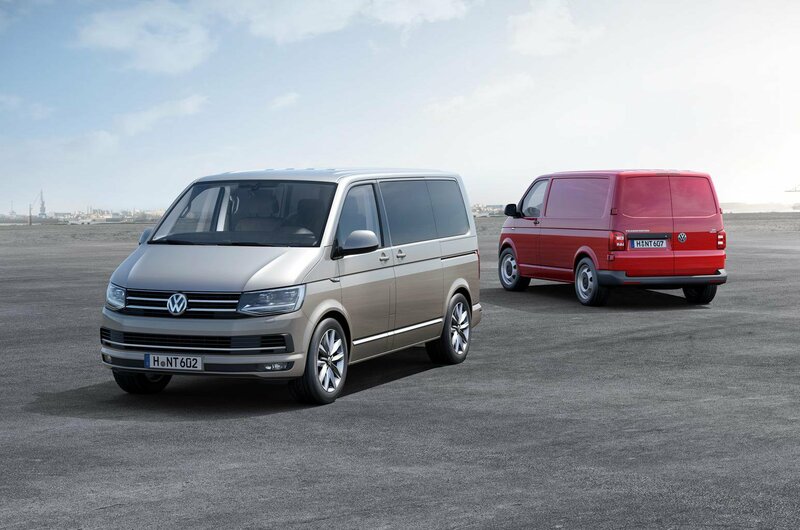 The Caravelle will go on sale after the sixth-generation Transporter's launch this coming Autumn. A Sportline trim will be added later, too. There are five engine options: Euro 5-compliant 2.0-litre TDI diesel engines with 82bhp, 100bhp, 138bhp and 177bhp states of tune are joined by three new Euro 6-compliant 2.0 TDI engines, with outputs of 100bhp, 147bhp and 201bhp. The 100bhp version will be available straight from launch, while the last two of those Euro 6 motors will join the range over the next 12 months. All 82bhp and 100bhp motors are offered with a five-speed manual gearbox as standard, while the 138bhp, 147bhp, 177bhp and 201bhp engines come with either a six-speed manual or Volkswagen's seven-speed dual-clutch DSG automatic gearbox. Pricing starts from £24,790 for the entry-level 2.0 TDI 82bhp Startline manual short wheelbase, rising to £40,222 for the 2.0 BiTDI 201bhp Highline long wheelbase DSG auto, with 4Motion four-wheel drive. What's the 2015 Volkswagen Caravelle like inside? Put simply, comfortable and spacious. Volkswagen has made a concerted effort to make the Caravelle feel more car-like in and around the driver's seat. It shares an identical multi-function leather steering wheel with the Golf hatchback, which is no bad thing, as the wheel itself has just the right thickness and feels of a high quality. The steering wheel and pedal positions are more like a van, however, with a naturally high position. This benefits all-round visibility, and ensures there's plenty of head- and leg room up front. There's plenty of adjustment in the 12-way electrically adjustable seats and steering wheel, which means getting comfortable is no chore. The dashboard is logically peppered with various switches and controls that are easily located while on the move. Perceived quality is very high, as expected from a Volkswagen interior. Like in its smaller Golf and Passat siblings, the Caravelle gains a 6.3in colour touchscreen infotainment system with multi-function display screen between the rev and speedometer dials, which shows directions close to your eye-line when using the optional (£816) navigation system. The excellent head- and leg room continues in the rear, thanks to the consistent high roofline. The middle row of seats are two individual chairs with armrests that face rearwards, which can fold flat and slide forwards and backwards. The third row of three seats can also be folded flat, slide forwards and can be split individually. Here, there's plenty of leg- and shoulder room for two large adults or three children. Sliding the seats individually can trade legroom for extra boot space. When the rear seats are locked in place, there's just enough room for a couple of small suitcases or a folding pushchair and a small bag. There are multiple cubby holes and storage areas in the front cabin, with a USB port and 12v socket located in the centre of the dash. Two large cubby holes are located either side in the back, with extra USB ports for rear passengers. As standard, entry-level Startline trim comes with electric windows and mirrors, a 5.0in colour touchscreen infotainment system, DAB radio, Bluetooth, two USB sockets and automatic post-collision braking system. Mid-range Trendline gains the multi-function display between the dials, cruise control, driver and passenger armrests, rear parking sensors and body-coloured bumpers, mirrors and door handles. Flagship Highline trim further adds climate-controlled air conditioning, daytime running lights, heated windscreen, leather multi-function steering wheel and gearlever. What's the 2015 Volkswagen Caravelle like to drive? We tested a 2.0TDI 147bhp version equipped with the seven-speed DSG auto gearbox and a 201bhp six-speed manual, both in range-topping Highline trim. Volkswagen predicts the 147bhp and 201bhp Highline variants to be the biggest sellers. Of the outgoing fifth-generation Caravelles, 74% were specced with the DSG gearbox and 26% with the manual. VW chiefs expect this trend to continue with this sixth-generation model. The 147bhp variant pulls cleanly away from a standstill and is certainly potent enough to move seven people and their luggage around. When mated to the superb dual-clutch DSG automatic gearbox and left to its own devices the motor hovers between 1500-2200rpm, shifting through its seven ratios seamlessly. On twistier country roads with steeper gradients you naturally have to work the engine a little harder, but it still responds keenly. The motor remains quiet and refined up to 3000rpm, however, beyond this it will start to emit a harsh tone all the way to its 4900rpm redline. A brief stint in an 82bhp manual version quickly emphasised its sluggishness, so we'd avoid that model. The 201bhp 2.0 BiTDI variant is a brisk performer and you'll never be left wanting for more power. It allows you to be lazier with the six-speed manual gearbox, happily relying on its hefty 332lb ft of torque from 1600rpm to pull you up to speed, without having the need to change down a gear. Although you certainly wouldn't mind using this manual gearbox. It's well-weighted, precise and has a relatively short action considering its Transporter van origins. There was some minor wind noise audible from the large door mirrors, while road noise was kept to a minimum. However, we'll reserve final judgement for that latter area until we get a Caravelle on UK roads. Its steering is precise and consistently weighted, however, there is some vagueness around the straight-ahead and it is a bit lighter than in its smaller Volkswagen siblings, such as the Passat. It does make manoeuvring around town easy, though. With our test cars riding on standard 17in alloy wheels, speed bumps and potholes sent thumps through the cabin, but the Transporter dealt with smaller bumps and road imperfections admirably. The sixth generation Volkswagen Caravelle is a well-rounded, genuine seven-seater with impressive perceived quality and a strong range of Euro 6-compliant engines. Priced from £24,790 it undercuts the Ford Tourneo Custom - which starts at £31,185 - and the Mercedes-Benz V Class (£39,100). A Tourneo Custom manual in range-topping Titanium 152bhp short wheelbase form comes in at £33,825, while the equivalent Caravelle Highline with a manual 'box is £32,398. The Tourneo offers one extra seat and has a slightly larger cabin, but its interior isn't as plush or intuitive. The Volkswagen also comes with a better range of engines. Ultimately, though, the Caravelle is still an expensive proposition for those looking to transport multiple passengers. Alternatively, we'd advise trying a seven-seat MPV such as a Seat Alhambra before choosing a van-based MPV like the Tourneo or Transporter. The Alhambra is much cheaper - from £25,630 - has a very practical interior and is a sharper car to drive.